Local group calls for more signs, city removes existing ones! A group of Winnipeggers wants to know why the city is quietly REMOVING speed limit sighs from residential areas. 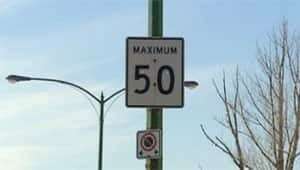 Wise Up Winnipeg, a group that monitors traffic law enforcement in Winnipeg, said the city has been plucking signs from East Kildonan that remind drivers the speed limit is 50 kilometres per hour. Chris Sweryda of Wise Up Winnipeg said the city needs more, not fewer signs to remind drivers to slow down. “I think it’s an obvious ploy to increase ticket revenues, and I think it goes against the city’s claims that they want drivers to just slow down,” said Sweryda. But city officials say residents should just know the speed limit is 50 km/h unless otherwise posted. Officials argue having the signs up provides inconsistency in the city and more are set to come down. Resident Matt Wrenn said he sees the sign removal as an attempt to raise revenue for the city. “I think you’ll see the signs are gone, and the radar vehicles are out,” said Wrenn. Patricia Matthews, who lives on Springfield Road, said she’s worried about the safety of children in the area. “I want them back up. There are so many children coming out of school here and crossing the road. It’s dangerous,” said Matthews. Sweryda said before the signs were removed, he told the city there were five signs each on McLeod Avenue and Springfield Road but none on Hespeler Avenue. He asked that the city put some up. “They responded by removing all the signs on McLeod and all the signs on Springfield,” said Sweryda. All 10 signs were removed, so Sweryda began a petition to save the signs. So far 259 East Kildonan residents have signed the petition. North Kildonan Coun. Jeff Browaty said the speed limit signs are not needed anymore because traffic volumes on those streets have dropped dramatically, and there have been fewer speeders. However, Browaty said he will act on residents’ concerns and ask officials to put the signs back up. “I have no problem with having additional street signs … if it helps residents feel better, but I don’t see a return of those signs being of much help,” he said. Browaty said if people want to catch speeders, the city should install photo radar cameras in the area. 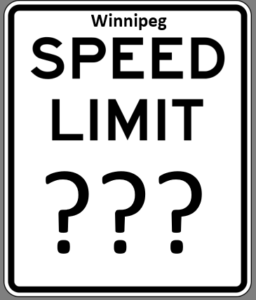 Should the City of Winnipeg be removing speed limit signs? While the approach seemed counter intuitive to us, so, lets fast forward a couple of years to show how things have turned out. Are drivers less confused by removing speed signage? Remember, the original article is from 2013, and many signs were removed across the entire city. Information released by the city now shows, that during this time, from 2012-2014, the number of tickets issued by the city over doubled. That’s a big change??? During this time, the number of drivers on the road didn’t double… so why did the number of tickets issued? The City has also not provided any evidence that things have been made safer? So far accident rates have increased along with the amount of revenue the city pulls in. Last year alone they made over $16 million dollars from traffic enforcement. The evidence points to manipulation of roadway engineering to increase ticket revenue. Another bit of interesting information shows that while the majority of the tickets issued are in the 10 to 14 km/h over range, over time, the number of 20 km/h and up over the limit is rising. One would assume if a focus to enforcement is the solution, why the the statistics show serious speeding is getting worse, not better? The question here also, is, would BETTER speed engineering, better road engineering, more and more frequent signs help? It appears that the statistics are clearly showing the sign removal experiment failed to make traffic slower, instead, it is having the opposite effect. and for Province wide compliance with National Signage Standards as outlined in MUTCD.